A bicycle born out of auto industry technology, the Mando Footloose makes claim of using the world’s first chainless series hybrid technology for an e-bike. Like other pedal-assisted electric bikes, the bike combines manual and electric power. Unlike other pedelecs, it eliminates the chain and transforms the cyclist’s motion directly into electricity. As integral as it is to the design of most bikes, the chain is arguably the most annoying component. It can dirty and rip your pant legs, requires a lot of maintenance, can make your life miserable should it rub against the derailleur or slip off the gears, and can break altogether, leaving you without a means of pedaling on flat or ascending terrain. It’s a necessary evil, at best. 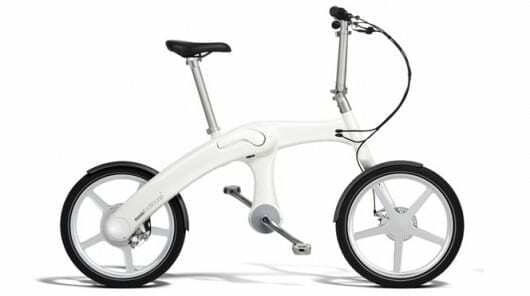 Korean auto suppliers Mando Corp. and Meister Inc. got together with British designer Mark Sanders and Dutch e-bike expert Han Goes to make a common evil a little less necessary. Like Polaris’ new e-bikes, the Footloose combines a throttle drive with pedal-assisted technology. Cyclists can power the bike up to 30 kilometers (18.6 miles) with the motor alone or pedal for more range. What sets the bike apart from others is that pedal input is transformed directly into electricity via an alternator connected to the crank. The electricity is stored in a lithium-ion battery and used to power the motor. So instead of powering the rear wheel, the cyclist becomes a human generator powering the motor. Similar to an automobile, the Footloose has an Electronic Control Unit (ECU), which works with sensors and an automatic gear changer to monitor terrain and adjust the motor’s output as necessary. The ECU also monitors the system for problems, which it displays via a handlebar-mounted Human Machine Interface (HMI). The HMI also displays metrics like distance traveled, speed and amount of electricity produced. It is removable and the bike will not start when it is removed, creating an integrated anti-theft feature.